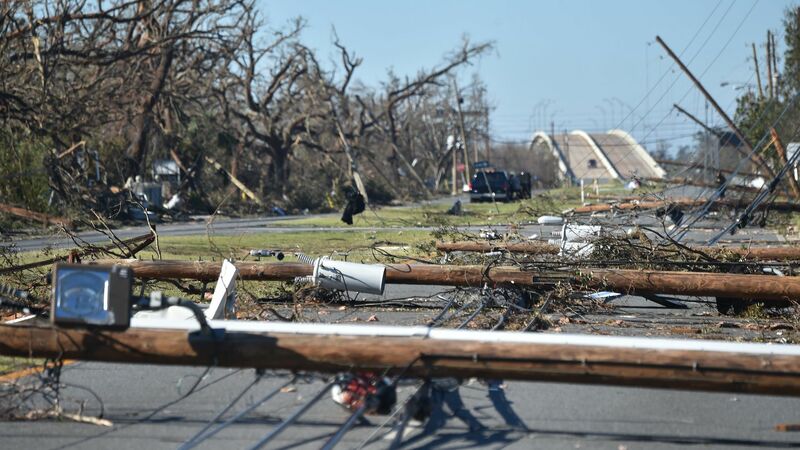 Hurricane Michael hit with such ferocity that parts of the Florida Panhandle resemble the site of a nuclear blast, rather than a weather event. The storm's full fury was reserved for a narrow strip of land between Panama City and Apalachicola, particularly the area in and around Mexico Beach. The impact: Michael wreaked havoc in the region where the menacing, 12-mile-wide eye came ashore. As seen in satellite images, the storm's winds and surge were potent enough to create a new island, destroy an entire beach town and lay waste to a strategically valuable Tyndall Air Force Base. Here's what Tyndall Air Force Base looked like before and after the storm. Note the loss of hangars, aircraft shelters, and entire buildings on the airfield and base itself. Before and after images of Tyndall Air Force Base, located just east of Panama City, Florida. Satellite image ©2018 DigitalGlobe, a Maxar company. The damage to the hangars is even more apparent in a zoomed-in view. This is the first time such a base has taken a direct hit from a storm this powerful since Category 5 Hurricane Andrew struck Homestead, AFB in 1992. That base never fully recovered. Damage to Tyndall AFB's infrastructure, including fighter jet shelters (top center). Satellite images ©2018 DigitalGlobe, a Maxar company; NOAA. Southwest of Tyndall, the hurricane created a new island. This is not unheard of with powerful hurricanes, but is still striking to witness. A new island created out of the St. Joseph Peninsula, Florida. Images: NOAA. Panama City, Florida, was exposed to some of the storm's fiercest winds within its towering eye wall, where clouds extended into the lower stratosphere, and air was rushing in to fill the void created by the extraordinarily low pressure at the center of the storm. The damage there is staggering, too. Hurricane Michael ripped this Panama City neighborhood apart. Satellite image ©2018 DigitalGlobe, a Maxar company. Go deeper: Our full Hurricane Michael coverage.